Butera Royal Vintage cigars are produced at Tabacalera de Garcia in the Dominican Republic where they are skillfully blended and hand rolled by "first row" master cigar makers. 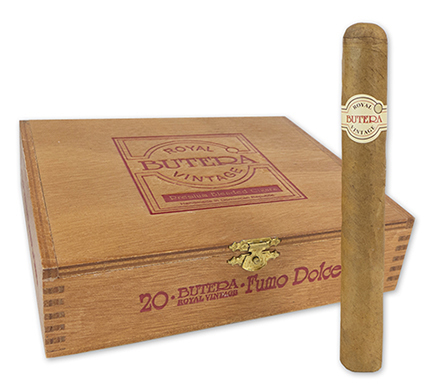 These cigars offer a unique blend of six distinctive whole-leaf tobaccos with four long-fillers from the Dominican and Brazil chosen from the rarest of vintage crops. The mild to medium-bodied cigars are covered in a full-flavored Connecticut Shade grown wrapper hand selected for deep color and silky smooth texture and well-aged in Spanish cedar to ensure the exceptionally smooth, spicy aromas, complex flavors, and taste characteristics connoisseurs have come to expect from these premium cigars.